Racal's initial success can be traced back to the production of the famous RA17 HF communications receiver in the late 1950s. This receiver had its origins in South Africa and was based on the drift-cancelling 'Wadley-Loop principle, the invention of Dr Trevor Wadley who worked for the South African Council for Scientific and Industrial Research. The South African company, SMD Manufacturing (Pty) Ltd built six prototype receivers for amateur radio use based on this principle. There was, however, little interest in the receiver in South Africa owing to its high production costs. By a lucky chance, the struggling Racal Company took over the receiver and proceeded to re-design it both mechanically and electrically. 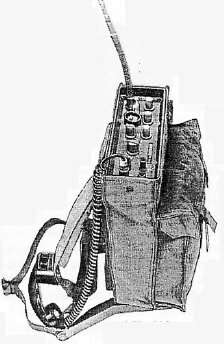 Several years later, SMD produced a crystal-controlled HF manpack transceiver, known as the RT14. There was some scepticism in Racal about its usefulness, but after a little persuasion Racal agreed to re-design it in the UK. The task for this was given to Jim Diggins, who had recently joined Racal from the Pye Company. The first prototypes for extensive field testing were ready by mid-1965, with full production by the spring of 1966. The receiver was given the designation TRA906 and better known as Squadcal, name coined by Racal to specify its main application in tactical net communication. In its final form, shown in the photograph, the transceiver covered the frequency range of 2-7 MHz in 29 channels, each selected by a separate quartz crystal. It had an output power of 5-watts peak envelope power (p.e.p.) and could operate in three modes: single sideband (SSB) telephony, SSB keyed telegraphy or compatible AM. It was fully transistorized and mounted in a sealed ABS plastic case, making it suitable for use in tropical conditions over the temperature range of -10C to +55C. All the electronics were mounted on a single printed circuit board, thus both adding to reliability and simplifying production. Operation was from a detachable 18-volt battery pack. Although designed initially as a manpack set it was soon adapted also for vehicle use. The main applications were both military and quasi-military, principally in overseas markets. It continued in production into the late 1970s and was sold to about 50 countries. The first contracts were to the Federal regular Army in Aden, to the Malaysian Police and to the Sultan's Armed Forces in Oman. Total sales of the transceiver were about 20,000. Squadcal was extremely simple to operate. In its manpack form there was a 2.4 metre (8 ft) whip antenna, but it could also use a dipole or end fed long wire, depending upon its application. The front panel controls consisted of a channel selector switch, a function switch (off, SSB, key, AM and tune), the main tuning control, an RF gain control, and a clarifier which fine tuned the SSB signal for optimum performance. Squadcal was an immediate success story for Racal and led to the formation of the Pioneer Division of Racal Communications, located in a unit on the old Woodley aerodrome close to Reading, with Jim Diggins as director in charge. Before long a powerful sales team was built up led by Geoff Bennett. Geoff Bennett has supplied me with as few interesting anecdotes about the TRA906: The rebels in Oman put a bullet through one, fortunately not hitting the operator, but it still worked (although no longer waterproof). Much later Geoff recounts that a UK officer said that a call on the radio at the time saved his life. There was also the story of a police superintendent in Malaysia who dropped a 906 out of a first floor window onto concrete to check if it was as rugged as Racal claimed. It was! One unusual contract was in Tristan da Cuhna, for use when fishing parties visited uninhabited islands. The coldest operation was with the British Antarctic Survey. For this Racal had to supply rubber handset cords as the PVC leads went solid and fractured. The hottest operation was probably in Libya, which recorded temperatures above 50'C. With the success of Squadcal Racal quickly expanded into a wide range of tactical HF and VHF transceivers, complete with separate high-power amplifiers and aerial tuning units for vehicle and fixed station applications. With continued growth it became necessary to move to larger premises, located on the south side of Reading close to the M4 motorway, and the Pioneer Division then became Racal Mobilcal Ltd. In 1969 Racal took over the Controls and Communications Group and then, in 1975, merged the BCC Radio Company with the Racal Mobilcal to form Racal Tacticom Ltd. BCC was a significant supplier of VHF radios to the UK government, having won one of the contracts for Clansman equipment. With this merger Racal was to become the world-leader in tactical radio equipment with sales to well over 100 countries. In later years Jim Diggins was to become a main board member of Racal and Geoff Bennett the Managing Director of Racal Tacticom. Other people to hold key positions were David Elsbury (an early Managing Director, who succeeded Jim Diggins and eventually became Chief Executive of Racal Electronics), Gerry Whent (later knighted) who, in turn, succeeded David Elsbury and then took over control of the Vodafone Company, following its establishment by Racal, Eric Ribchester (Technical Director, eventually succeeded by John Edwards), and Leslie Pidgeon (Financial Director). From small beginnings: Several other Racal Tacticom people were to make their mark in Racal Vodafone (later to become Vodafone plc), the most successful cellular radio company in the world - and all this because Racal adopted the South African RT14 and turned it into Squadcal.